Since 1994, Buffalo Bill's Roadhouse has been serving up some of the greatest food you've ever tasted. Buffalo Bill's Roadhouse is a family-oriented restaurant featuring its very own house specials, including ribs, smoked right on the premises. Our primary menu items are ribs, chicken wings, salads and sensational sandwiches with lots of side dish selections. We have a large selection of foreign and domestic beers, and there's plenty of soft drinks for the kids. We have Beer-To-Go and you can make your selection from our 8-door cooler case. In warmer weather, we feature a large tent adjacent to the building so you can enjoy our great food outdoors. There's plenty of free parking and we're conveniently located just across the Trentum Bridge off the Route 28 Expressway Exit 14. More than a decade ago, Bill Callahan Sr. and his wife Judy put their faith and hopes in an idea. That idea turned out to be the centerpiece of a very successful business in their own home town. They were thinking of a way to prepare chicken wings without the process of deep frying. They experimented with a special oven with a conveyor belt that allowed the chicken wings to pass through the heating chamber and exit as crisp and tasty as if they been prepared the old way. Buffalo Bill's chicken wings are actually baked in an oven, not deep fried. So, the end product is a healthier way to enjoy chicken wings. In addition, Bill and Judy developed their own special sauces and now feature 13 varieites. When the doors to Buffalo Bill's Roadhouse opened in 1994, Bill and Judy were ready to put out the best. 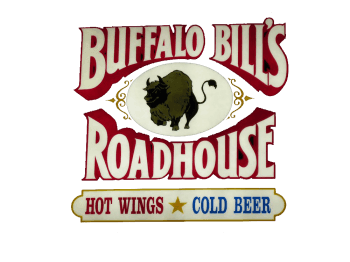 When you order chicken wings from Buffalo Bill's Roadhouse, you're getting the best there is around here. They're so popular, they prepare 1 1/2-tons of chicken wings in a single week. The good eatin' doesn't stop there. Their Bar-B-Q Ribs are considered by many to be the absolute best-eatin' ribs in the area. First, Bill and Judy place the ribs in a smoke-house right on the premises. These great-tasting ribs are served with a special sauce, and they're the talk of the town. Buffalo Bill's Roadhouse is family-oriented with seating arrangements for about 50 patrons. These life-long residents of the New Kensington area invite you and your family to sample their menu.